The Colorado Oil & Gas Conservation Commission (COGCC) governs the permitting and regulation of oil and gas wells throughout the state. 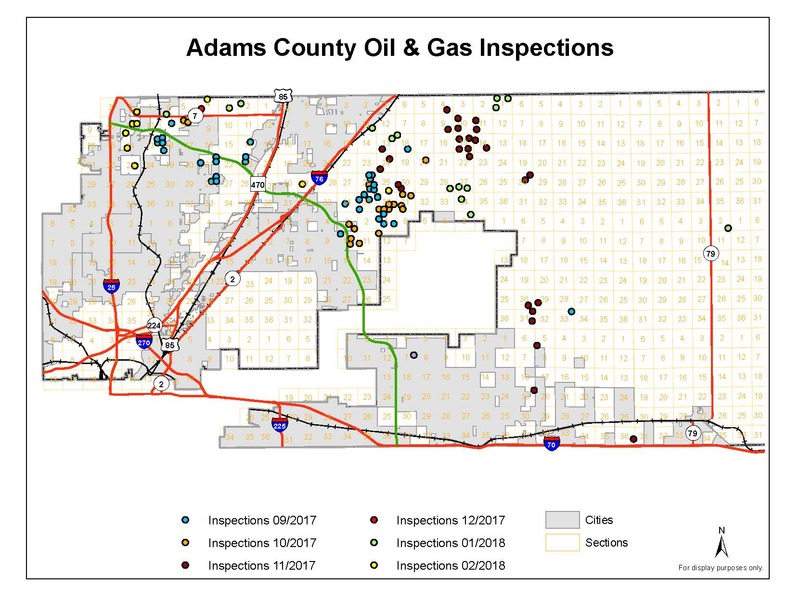 Adams County has limited authority when it comes to the oversight of oil and gas operations within unincorporated areas of the county. The Special Use Permit option requires a public hearing before the Board of Adjustment (BOA). In lieu of an SUP, an operator may elect to enter into a Memorandum of Understanding with the County. Operators who hold MOUs with the County must also receive a site-specific permit in the form of an Administrative Use by Special Review. The Development Standards and Regulations outline the processes for obtaining an SUP, an MOU, and an AUSR permit in detail. 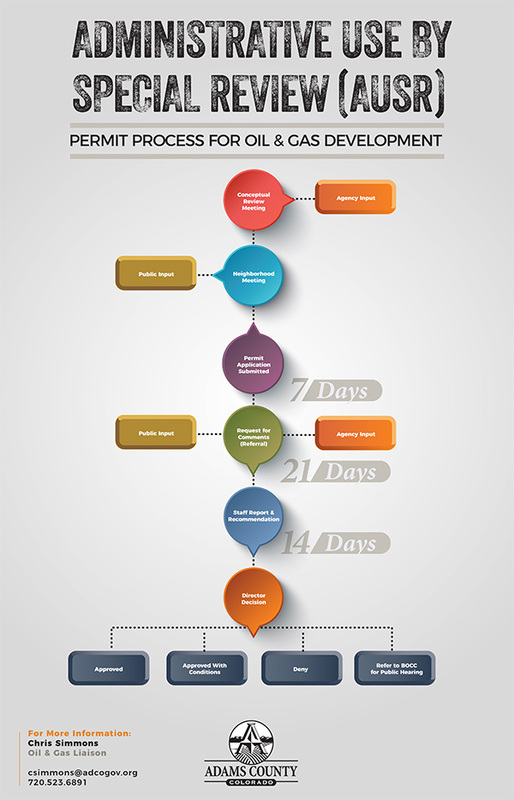 Click here to download a larger version of the flow chart at right that depicts the AUSR permit process. The county strives to make available timely and accurate information on all types of development within unincorporated areas. In order to better inform the public about oil and gas operations in the unincorporated areas of Adams County, the county provides a Weekly Oil and Gas Activity Report. The data supplied in the activity report is collected primarily from the COGCC. The report includes state and county permit status updates, maps of well pad locations, and information about any reported spills. 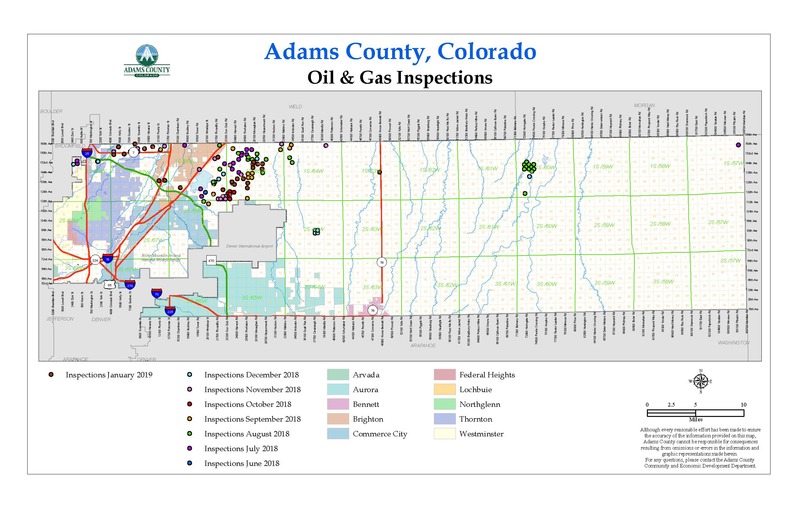 The inspector position was created when the Adams County Board of Commissioners entered into an agreement with the Colorado Oil and Gas Conservation Commission (COGCC) in an effort to increase public outreach and provide administration of the county’s new oil and gas regulations approved in March 2016. Under this agreement, the inspector position is funded by the county, trained by the COGCC, and is inspecting on behalf of both agencies. The the Oil & Gas Inspector is responsible for field inspections, complaint response, and participates in state and county enforcement of regulations. Proper positioning of valves and hatches. County USR Permit site-specific conditions of approval. For a list of the most recent inspections of wells located within unincorporated Adams County, including links to the respective inspection reports, click HERE. The Community and Economic Development Department worked with TischslerBise and Felsburg, Holt & Ullevig, to develop and recommend a traffic impact fee for oil and gas development which was approved by the Board of County Commissioners in a public hearing on Tuesday, June 19, 2018. An orphan well is an oil and gas well that no longer has an operator responsible for maintaining it. These sites may result in adverse environmental impacts because no responsible party can be found, or such responsible party is unwilling or unable to mitigate such impacts. These wells and associated sites ultimately become wards of the state. Former Governor John Hickenlooper signed an executive order in July 2018 to address the potential safety issue of orphan wells, requiring their disclosure, ranking of priority, and cleanup. Adams County is home to 21 orphan wells and 12 orphan sites with oil and gas infrastructure; information on these wells has been compiled by County staff and can be found here. For the most up-to-date information, please visit the COGCC website at http://cogcc.state.co.us/reg.html#/enforcement/orphans In addition, the COGCC Interactive Map (https://cogccmap.state.co.us/cogcc_gis_online/) has a layer showing the location and current status of orphan wells. Who Has Applied & Where? Concerned about your health and oil & gas operations? Contact CDPHE's Oil & Gas Health Information and Response Team at 303.389.1687 or www.colorado.gov/OGhealth.